When the week 6 CSA box held leeks (yeay! leeks! ), I knew that I had to make potato-leek soup. It’s one of those great dishes that I have no idea why I don’t make it. So, here I am. Making it. I perused some recipes to see what others have done in terms of making a soup, but most of the soups I saw involved the use of a stick blender or a food processor to make the soup smooth. I knew that might not improve acceptance from the kids, and neither dh nor I were really interested in a smooth soup. Chunky seemed the way to go. I also saw some folks suggesting that you put bacon in during cooking or after, and I liked the idea of bacon during cooking, to impart some extra flavor. What this then turned into is basically a loaded baked potato soup with leeks and shallots AND THERE’S ABSOLUTELY NOTHING WRONG WITH THAT. Before bringing this to the table, I hit up the grocery store for a nice crusty boule – and that went ever so nicely. Soup on a crisp Fall night is great, but soup with a nice crusty bread is just divine. I will note that dh and I diverge a little on soup style. He wanted chunky, and I was happy to oblige. He wanted something chowder-esque, being a native New Englander, so I obliged. However, when he dared tell me afterward that we could have gone with less bacon so that the flavor of the soup could have been more subtle, that’s where I drew the line! Less bacon? Did he know who he married? I’m no Paula Deen, but saying “too much bacon” near me is like claiming that a dessert has “too much chocolate”. Say what? Try again, buddy. I know that “subtle” is code for “bland”, because native New England food isn’t always known for having much spice to it. However, I’m NOT a native New Englander, and I believe in flavor! So, no bacon corners were cut in the recipe listed below. I stand by all that bacon. Mmm. Bacon. As for the servings below, please note that a “serving” is a single bowl. 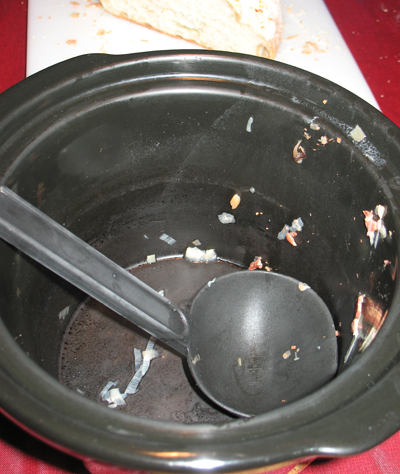 Since dh and I each had two bowls + bread as our entire dinner, we emptied the crock pot between us. If you serve this as an appetizer/soup course/accompaniment to a larger meal, then you can probably get away with 4 servings. If you plan to serve this as a cup of soup, rather than in a bowl, you could probably get 6 servings, easily. 1. Wash the leeks and remove the stems; you’ll only be using the white part of the leeks. Thinly slice the leeks and add them to a 4qt crock pot. 2. Wash and peel the potatoes; remove any eyes. Then give them a quick rinse and dice them. Add the potatoes to the crock pot. 4. Crumble or roughly chop the bacon slices so that no piece is more than about 3/4 inch wide. Add the bacon to the crock pot, then stir to combine all of the ingredients. 5. Add the broth, salt and white pepper to the crock pot, then stir to combine. 6. Add the bay leaf. Cover and cook on LOW for 8-10 hrs. 7. Remove the bay leaf. Add the sour cream to the crock pot and stir well to combine. 8. Serve with cheese on the side and allow people to add cheese on top, as they wish. I made this recipe and it turned out wonderfully. The best potato and leek soup I’ve ever tasted.